Efficiency and energy recovery, size, power, remote monitoring and unmanned operation: modern steam generators offer a wide choice to better respond to different food processing needs. There are many food processing firms that use steam generators of various powers depending their needs. The choice of the boiler has to be well thought-out. There are many aspects to be taken into account, such as: consumptions, performance, energy recovery, dimensions, power, and unmanned operation, etc. There are steam generators operating with low pressure up to 1 bar, medium pressure up to 15 bar, and high pressure over 15 bar. In general, food industries use medium pressure. Energy efficiency is one of the main factors, even if not the only, for the choice of a steam generator, since it contributes to reduce energy production costs in industrial processes, constantly on the increase. An increase which inevitably lengthens the payback time of a plant. Particular attention goes to the reduction in the amount of fuel necessary for the production of steam. Modern steam generators promise not only the maximum thermal efficiency, even up to 98%, but also the reduction of NOx emissions (nitrogen oxides and mixtures that are produced as by-products during combustion), the consumption of fuel and electricity, the increase of safety and ease of management of the plant. Steam generators are constantly monitored, even remotely. Any variation in values is immediately identified and recorded. Steam generators for every need. The food processing firms can choose between a wide variety of high-efficiency boilers, boilers with a high steam content and high construction standards, in accordance with the PED Directive (Pressure Equipment Directive) 97/23/EC on pressure equipment and other relevant regulations. Steam generators can operate using electricity, natural gas, LPG, diesel oil, fuel oil, biomasses, pellets etc. In fire-tube steam generators, fumes pass through a bundle of tubes immersed in the water contained in the generator. By passing through the tube bundle, the heat of the fumes is transferred to the water, and the exhausted fumes are cold. At the same time, the absorbed heat heats the water creating steam. 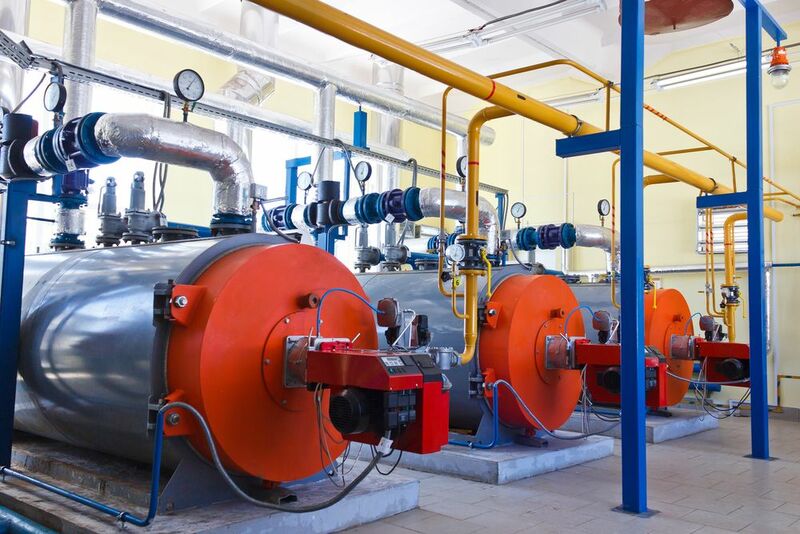 Fire-tube steam boilers are characterized by a large volume of water, and thanks to continuous technological improvements there is an increasing demand even for industrial applications requiring lower power. The most widespread layout is with three smoke passes, providing the best possible seasonal efficiency and lower emissions, in line with the current regulation. Three-ways smoke boilers are available in different versions. In the standard two-stage model, the boiler operates with two potentials and two burner flames, at 50% and 100%. In the modulating version, the boiler operates by power from a minimum of 30% to a maximum of 100% by means on an inverter. 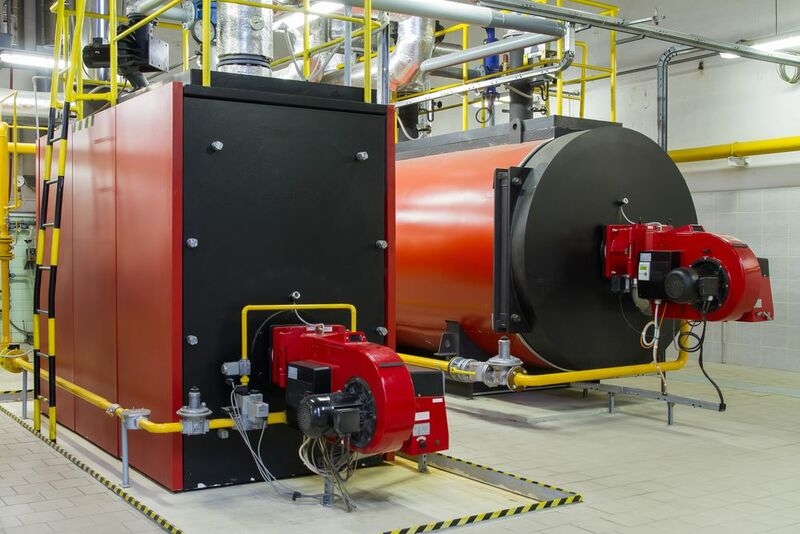 Finally, in the progressive two-stage version, the boiler operates with two potentials and two flames with the possibility of fall below 50%, unlike the standard two-stage version. The inner tube bundle can have two different structures. One of these can be constituted by concentric coils in carbon steel, to obtain the maximum heat exchange surface between water and combustion fumes. In any case, manufacturers pay particular attention to the prevention of deposits on the coils to prevent the possible obstruction. Hence, the feeding flow of the boiler is constantly monitored, fumes and steam are controlled by thermostats, and lights on the electric control board warn the operator if a chemical wash-down is required. Instantaneous coil steam generators are available both in vertical and horizontal versions. Instant steam production means that the production of steam begins a few minutes, generally 2-3, after the ignition of the burner. In water tube steam generators, water flows into the tube bundles with a high exchange surface and is heated by the combustion gas; smoke tube boilers instead have water surrounding the tubes. On the market, there are also heat-recovery steam generators that recover the heat from a hot gas stream to produce hot water or steam, according to the needs. Heat-recovery generators have no firebox and, hence, no burner, since water is heated by the heat of the conveyed fumes, thus allowing the recovery of part of the energy that otherwise would be lost. In diathermic oil boilers, the forced circulation of the fluid in the tube bundle is produced by the circulation pump, which ensures a constant and uniform circulation of the fluid at the desired speed, without oil overheating, thus preventing cracking phenomena, which would lead to the formation of carbonaceous deposits, with consequent reduction of the internal volume available for the flow, conductivity and efficiency. The diathermic oil has a high thermal stability (up to 320-350°C. If this threshold is exceeded, however, oil begins the cracking process, i.e. the process whereby organic molecule chains are broken down with consequent formation of hydrocarbons. Therefore, particular constructive attention is required, as the installation of circulation pumps to keep under control the heat transmission in the generator. 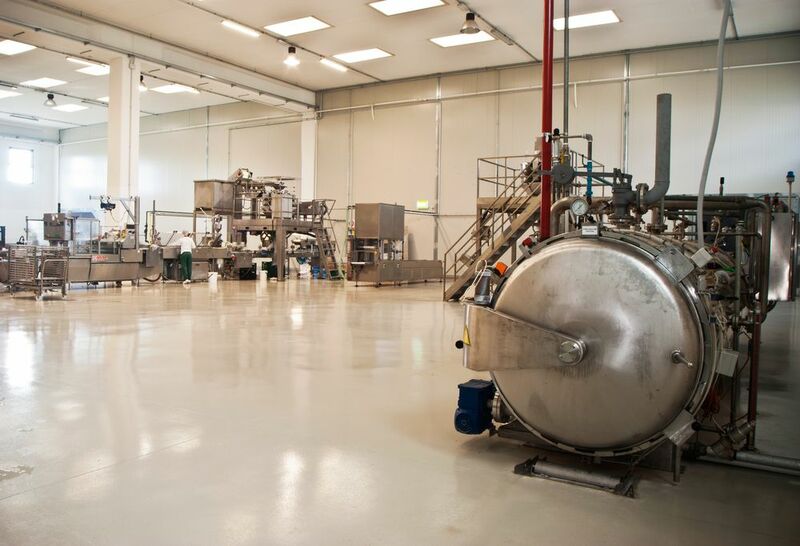 The temperature of the oil film in contact with the walls must be kept below the limit threshold; in particular it must not exceed 25-30 degrees with respect to the cracking temperature of the diathermic fluid in use. The flow speed must not be excessively low, in order to prevent local overheating that would lead to cracking phenomena. For this reason, even in the event of a plant shut-down, the diathermic oil must be kept in circulation until the oil temperature drops below 200°C. It is also important that the combustion chamber and the tube connections exposed to the heat are perfectly shielded during construction to ensure a correct and efficient heat exchange. Some companies locate the steam/thermal power station in containers to solve problems of space or the location of the plants. The steam generator is installed inside a container equipped, full of accessories (water storage tanks and condensate return, softeners, heat exchangers and steam reduction groups) and delivered to the customer ready to be put into operation. Guaranteed thermal efficiency. Thermal efficiency seems to have become a prerequisite for steam generators. For this reason, manufacturers use high-performance burners and a good insulation, in order to prevent heat dispersion. In steam generators of the last generation, the insulation with refractory ceramic fibers is provided also for smoke box, front doors and hydraulic connections. The insulation is also carried out with rock and glass wool to avoid thermal inertia. The external stainless steel lining, if present, prevents premature ageing caused by rust, and provides higher mechanical strength than a sheet of painted iron or aluminum. Everything under control. Modern boilers are controlled by an electric switchboard including general switch, starting the burner, speed selector in the two-stage mode, digital steam temperature controller, block warning lights in case of water block, overload block, pressure block, chimney block, maximum water pressure, steam block and burner block. Integrated in the electrical panel, in many cases, there is a diagnostic system that monitors and reports on the main functions of the generator. Systems for the computerized control of all parameters of a plant can be installed. Energy recovery. Energy recovery is an important factor in the choice of a steam generator. Many plants are designed to reduce energy losses, improve the production of steam and reduce fuel consumption. It is possible to recover heat from the fumes and from the flash steam generated in the condensate return, which carries a high energy content, and by cooling the emissions of the steam generator. Savings can be achieved also with a good adjustment of the burner. The flow rate of flash steam can also reach 10-15% of the mass flow rate of the condensate, with a substantial loss of energy. An exchanger-condenser before the condensate tank allows the recovery of the energy contained in flash steam vapor flash (by condensing it). It is possible to install heat recovery units or economizers to recover the heat, which otherwise would be lost in the combustion fumes. These measures contribute to increase the efficiency of a plant and, consequently, considerable energy savings. A heat recovery unit substantially is an air-to-fumes exchanger to be installed at the exit of a steam generator to increase the temperature of the air of the burner. The economizer, on the other hand, uses fumes heat to preheat the boiler feed water. It is preferred first for its reduced dimensions. It is also possible to install a capacitor after the economizer so as to recover more energy, with a further improvement in the efficiency of a plant. Treatments for water purification. The quality of the waters fed into steam generators must be controlled as required by the standards UNI EN 12953-10 (for fire-tube generators) and UNI EN 12952-12 (for water tubes generators), and must undergo chemical-physical treatments, to reduce the risk of corrosion and formation of deposits that may affect the operation of the generator. It is necessary to remove from the feed-water : the salinity in order to prevent deposits; dissolved gases to prevent the risk of corrosion; and organic substances to prevent foams and deposits. Therefore a water purification treatment must be equipped with a softener or thermal degasser.